Deuteronomy 14:22 “You shall tithe all the yield of your seed that comes from the field year by year. 23 And before the Lord your God, in the place that he will choose, to make his name dwell there, you shall eat the tithe of your grain, of your wine, and of your oil, and the firstborn of your herd and flock, that you may learn to fear the Lord your God always. 24 And if the way is too long for you, so that you are not able to carry the tithe, when the Lord your God blesses you, because the place is too far from you, which the Lord your God chooses, to set his name there, 25 then you shall turn it into money and bind up the money in your hand and go to the place that the Lord your God chooses 26 and spend the money for whatever you desire–oxen or sheep or wine or strong drink, whatever your appetite craves. And you shall eat there before the Lord your God and rejoice, you and your household. 27 And you shall not neglect the Levite who is within your towns, for he has no portion or inheritance with you. 25 And the Lord spoke to Moses, saying, 26 “Moreover, you shall speak and say to the Levites, ‘When you take from the people of Israel the tithe that I have given you from them for your inheritance, then you shall present a contribution from it to the Lord, a tithe of the tithe. 27 And your contribution shall be counted to you as though it were the grain of the threshing floor, and as the fullness of the winepress. 28 So you shall also present a contribution to the Lord from all your tithes, which you receive from the people of Israel. And from it you shall give the Lord’s contribution to Aaron the priest. Deuteronomy 12:17 You may not eat within your towns the tithe of your grain or of your wine or of your oil, or the firstborn of your herd or of your flock, or any of your vow offerings that you vow, or your freewill offerings or the contribution that you present, 18 but you shall eat them before the Lord your God in the place that the Lord your God will choose, you and your son and your daughter, your male servant and your female servant, and the Levite who is within your towns. And you shall rejoice before the Lord your God in all that you undertake. 19 Take care that you do not neglect the Levite as long as you live in your land. Malachi 3: 7 From the days of your fathers you have turned aside from my statutes and have not kept them. Return to me, and I will return to you, says the Lord of hosts. But you say, ‘How shall we return?’ 8 Will man rob God? Yet you are robbing me. But you say, ‘How have we robbed you?’ In your tithes and contributions. 9 You are cursed with a curse, for you are robbing me, the whole nation of you. 10 Bring the full tithes into the storehouse, that there may be food in my house. And thereby put me to the test, says the Lord of hosts, if I will not open the windows of heaven for you and pour down for you a blessing until there is no more need. 11 I will rebuke the devourer for you, so that it will not destroy the fruits of your soil, and your vine in the field shall not fail to bear, says the Lord of hosts. 12 Then all nations will call you blessed, for you will be a land of delight, says the Lord of hosts. Matthew 23:23 “Woe to you, scribes and Pharisees, hypocrites! For you tithe mint and dill and cumin, and have neglected the weightier matters of the law: justice and mercy and faithfulness. These you ought to have done, without neglecting the others. IX. Why Do We Give Money to Church? 1 Timothy 6: 17 As for the rich in this present age, charge them not to be haughty, nor to set their hopes on the uncertainty of riches, but on God, who richly provides us with everything to enjoy. 18 They are to do good, to be rich in good works, to be generous and ready to share, 19 thus storing up treasure for themselves as a good foundation for the future, so that they may take hold of that which is truly life. 2 Corinthians 9:6 The point is this: whoever sows sparingly will also reap sparingly, and whoever sows bountifully will also reap bountifully. 7 Each one must give as he has made up his mind, not reluctantly or under compulsion, for God loves a cheerful giver. 8 And God is able to make all grace abound to you, so that having all sufficiency in all things at all times, you may abound in every good work. the simple answer is… there is no set amount! This entry was posted in Bible Reference Notes, Expository Moments, Sola Scriptura, Theology and tagged Giving, Tithe, Tithing. Bookmark the permalink. Very good thoughts here, brother. I am personally in full agreement with your conclusions. This is well done as well as biblical! I wish every “Christian leader” would get a handle on this and end the confusion! Act 20:33 I coveted no one’s silver or gold or apparel. Act 20:34 You yourselves know that these hands ministered to my necessities and to those who were with me. Eph 4:28 Let the thief no longer steal, but rather let him labor, doing honest work with his own hands, so that he may have something to share with anyone in need. Though our work of spreading the Gospel is to have a global reach, to get there takes a local reach where committed Believers work together for the common good and for the building of the body up to be a healthy beacon of hope to the downtrodden and hopeless. Of course in due course marriages come and with that children and with that training in Righteousness. Local churches, true families living and building together building one another up in love are the seed beds for evangelism to the last man! What sometimes happens though, sadly, to the last man is corruption is not excised from the community and then the community, to the last man, to one degree or another, comes into judgment and cessation. Here’s that example: Gen 19:4 But before they lay down, the men of the city, the men of Sodom, both young and old, all the people to the last man, surrounded the house. Here’s the good example which a healthy growing community of believers should aim towards constantly: Rom 15:14 I myself am satisfied about you, my brothers, that you yourselves are full of goodness, filled with all knowledge and able to instruct one another. 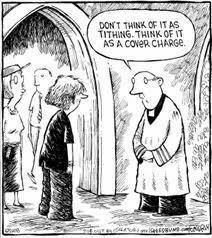 I used to go to a certain ‘church’ (loosely using that term) where I was continually threatened with being placed under a curse if I didn’t tithe. What a damnable lie to tell a young, blood bought saint who is blessed with all things in Jesus Christ that they are under a curse if they don’t tithe. Those ‘leaders’ who have the hearts of min-popes rather than servants willfully spread the confusion for selfish gain deceiving and being deceived (of course many also do it out of vain tradition though their hearts may be right). If a man of God is called as an under-shepherd or to the mission field he may choose to work a side job to support himself, or if the Lord wills that he be committed full time to the word and to prayer he may choose to trust that his support will come (free of compulsion) through those whom the Lord lays it on their hearts. That would put about 90% of christendom out of business though wouldn’t it. Amen, Michael! We ARE to be generous, especially within the household of faith. This article is not about New Covenant giving, it is a rebuttal to those who think Christians ought to tithe. What is meant monetarily by double honor? What is meant by giving a worthy widow monetary honor ? How much money is in mind here? The worthy widow with no other available support was to be supported by the church. On the surface it would appear that elders are to receive only twice what a worthy widow receives. Throw into the mix that the according to Paul when we come together we should have multiple elder/teachers trading off teaching the people 1 Cor. 14. Paul further commands that everything said and taught and prophesied and every tongue interpreted was to examined on the spot by all of the elder in front of the congregation. Who are we to question the pointed explicit instructions of Paul? I understand that it was a Jewish tradition to have single teachers in the local synagogues. Even so they passed around the scroll to multiple worthy elders. This is why they passed the scrolls to Jesus. The single teacher format was then copied by the RCC. This was then copied by the reformers. I would suggest a possible radicle idea. We should stop imitating Rome and the Jews and follow the Apostles instructions. We should abandon the solo act of one highly paid preacher and obey Paul and have several elder/teachers all of whom receive this double honor equally. This stipend should be twice the stipend of a worthy widow and no more than that. This would be the end of the super stars raking in 6 and 7 figures while giving worthy widows squat. No one elder should ever be allowed that much power and authority and status and star power and income. Since when are we instructed to determine a solo act pastors income based upon a modern American business executive pay scale model? Paul, inspired by the Holy Spirit, would not negate his explicit instructions with the phrase…let all things be done indecency and order. Nor is it right to reject Paul’s inspired instruction simply because sign gifts have or have not ceased. Nor is it right to compare how an Apostle such as Paul taught with a mere elder. Every Sunday, it would seem, all the elders may be allowed to teach and all the elders examine what was said. T.I.Miller – What does your comment have to do with the article or its content? If you want to discuss the errors of certain ecclesiological models, I would be happy to engage you on that, as it appears we are in agreement. New Covenant giving is not based on Old Covenant tithing. I am at a loss to understand your point in relation to the article. So you suggest a new law on how to give compulsively! Be careful not to swap out the errors of the church system with your own friend. All giving is to be liberal and from a joyful heart, not under any compulsion on the amount. If your Pastor says you need to tithe 10% before taxes I’d ask him if he has ever read his Bible. As a young Christian I was very confused on this topic. I read what the Bible said and couldn’t justify it with what the Pastor was preaching. It caused me to doubt my faith when I was young. Pragmatism has no place in the Church. But Bob, Christians are not supposed to read the Bible and seek wisdom from God; we’re only supposed to believe our local popes, who stand up on a high platform and tell us what God told them! You would not believe (you might believe) the number of people on bivocational ministry blog on LinkedIn that think we MUST tithe. It’s as a dear brother put it – since the Reformation we’ve had those who hold to the regulative principle; those who hold to the normative principle. But now, with Finney’s influence being compounded by Schuller, Hybels, Warren and countless others, we have the affective principle – we do what affects the people in the manner we want them affected. Give me the Word of God rightly taught and preached and trust God to that work He alone can do.